Get in Here Peak Milk Consumers! Can you tell which is fake? My reaction before even taking a stab at guessing was “Oh Wow”. 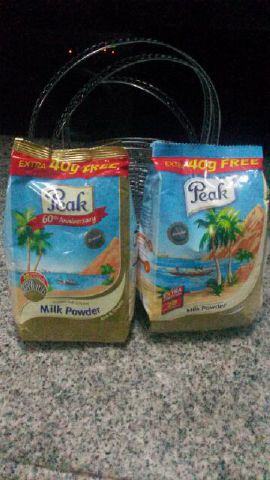 I grew up consuming Peak milk so you can imagine my dismay finding out fake Peak milk exists! I looked at both packages and something seemed a little off with the Peak milk on the right, so I guessed that was the counterfeit product. Apparently, my friend’s sister, who has a toddler by the way, had stopped by Danny’s Supermarket, Agungi to pick up Peak milk for her family. She’d bought the Peak milk pictured on the right and paid full-price for it, only to later taste the product and discover it wasn’t Peak milk! In fact, she said it tasted nothing like milk!! I’m not sure what the advise here is but we’ve all got to be really careful. Fortunately for my friend’s sister, no one else in her family tasted the “milk”. But let us take a step back and think for a minute: What if she had fed the milk substance to her toddler?!? What if the toddler got some kind of food poisoning and ended up in the hospital? I can totally see how this story could have ended in a more catastrophic outcome. I think the folks who deal in counterfeit food items have no conscience whatsoever and should be dealt with very seriously. HABA!! Having said that, the lesson here is we should all be careful. I’m thinking “nowhere in Naij is safe” but my advise would be to stick with the bigger supermarkets brands when buying food stuff. Why? Well, I’m thinking… If I buy fake milk from Shoprite I will return it and speak with a manager. Maybe I won’t sue Shoprite, but I’m assuming they’d be smart enough to carry out some form of investigation and get all the other fake milk off their shelves. On the other hand, my assumptions that Shoprite would be more proactive about stuff like this could be completely wrong. Regardless, I highly welcome your thoughts/suggestions to alleviate this issue. It’s appalling!! My dear.. I’m getting scared of everything in Naija, they recently closed chocolate royale because of fake products. If she’s still got the receipt for the milk I’d suggest she goes back and alert them. Before someone gets hurt. Na wa for this nation.. that’s how someone saw little alien inside chivita recently. Nothing is safe again in this country.. even Eba. Her husband took the milk back there, scolded them and demanded a refund which he got after he told them he was going to report them to NAFDAC. The big names are even worse, they sell all sorts of fake and would return your money in an instant, but would that keep the fakes off the shelves? Definitely not, they just do it so as to keep their “reputation”. The problem we have in Nigeria is soo deep. I’m still considering reporting this to NAFDAC because they would definitely sell more fake products to unsuspecting consumers. By the way, there’s a fake paracetamol syrup for kids, The Nigerian Calpol!!! When will this madness stop? I sent this post to NAFDAC on twitter and I’m still awaiting a response. This is the height basically.. Peak milk and fake just doesn’t go.